There’s something deeply personal about Home. 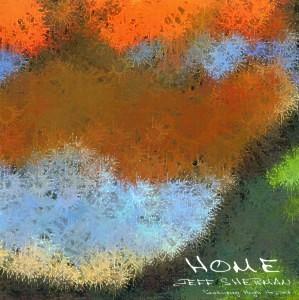 Like that place where our lives exist and our memories dwell, the second solo effort from Jeff Sherman, keyboardist and bassist of progressive rock Group Glass, is rich, warm, vibrant, cool, simple, complex, and colourful, and hints at memories both comforting and disconcerting. Another effort of what Sherman refers to as “progressive ambient music”, it’s ambient in the sense that, as the cover art suggests, the music is very impressionistic, and progressive in the sense that it never lapses into the background, remaining a consistently innovative and exciting listen throughout. Burying Euphoria opens the album. Built on the 33-year old recording of a teenaged Sherman and his rock band Glass along with a high school chamber group, performing a piece he wrote back then. Sherman has layered in other samples from numerous sources: a staggering array of natural (including VLF recordings of the earth’s magnetosphere), technological, and musical sounds. What I really like is that every sample is carefully chosen to bring out the theme of the piece (one of lost innocence), never placed in there just for random effect. The track is built up with some throbbing bass guitar and a smoking synthesizer solo performed by his brother Greg. The result is a complex piece of music that conveys the multitude of emotions associated with the theme. The title track digs into the vault again, utilizing a recording of Sherman playing acoustic guitar from a track that appeared in its original form on the Glass album No Stranger to the Skies. As he says in the liner notes, part of the concept of this album was “returning home to unfinished business”, and he had always wanted to release a version of this song closer to how he wrote it. Adding in Mellotron, sampled vibes, and the sound of a crackling fire, the piece achieves a thoroughly intimate atmosphere, and is a completely delightful contrast to the first track on the album. The Apes and the Auroras is the first of two pieces on the album that are transatlantic collaborations with legendary Soft Machine bassist Hugh Hopper. Utilizing a tapestry of modified samples (including the recording of the magnetosphere mentioned above and great apes communicating through hollow logs), Sherman weaves a deep and spacey soundscape with Hopper joining him on fuzz bass. The piece is melodically complex and unpredictable. Like Burying Euphoria, The Apes and the Auroras is sonically dense, and even a little difficult to get into at first, but repeated listening reveals its stark and mesmerizing beauty. Hopper joins Sherman again for the amazing 25-minute finish to the album, the expansive and evocative Rainy Day. Through a calliope-like sequence and a gentle and meandering, Eno-like meditation of piano and synth loops, sound samples emerge, gentle touches of life. It weaves its way languidly to a lovely, jazzy, even toe tapping bass guitar bit that ends the piece. All these disparate parts may sound contrary to one and other, but work together marvellously well creating moods that contrast and complement each other. Yet the piece as a whole manages to remain refreshingly spacious and breezy after the sonic density of Apes. It’s the perfect end to the album. As I said, there is something deeply personal about Home. But that doesn’t mean that only Sherman himself can relate to it. Far from that, it musically touches on so many aspects of human experience, that ultimately, it has the ability to reach into anyone and touch them. After all, doesn’t everyone at some point in their lives feel the need to return home? For more info, visit the Relentless Pursuit Records Web Site at: http://www.rpursuit.com.